Northwest rivers had unseasonably high temperatures this summer, warm enough to kill thousands of migrating sockeye salmon headed to the mid-Columbia and lower Snake rivers. 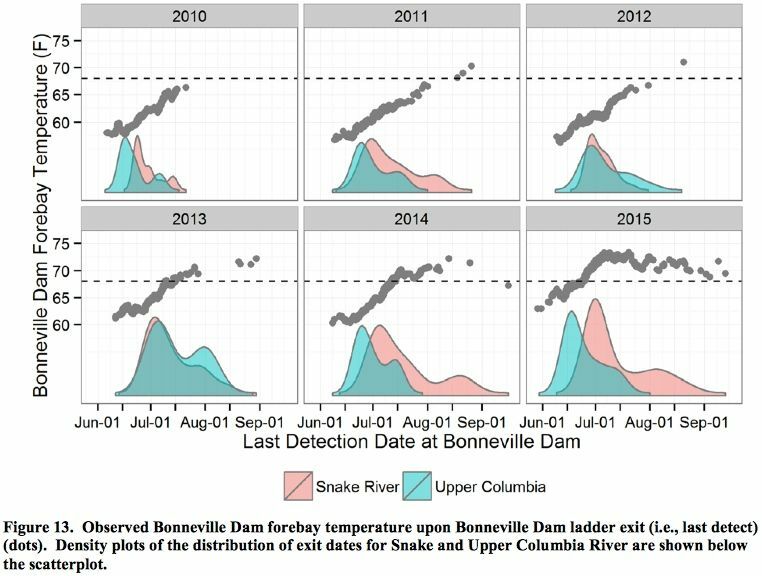 "As a result of this review, our overall conclusion is that elevated water temperatures in the Columbia and Snake rivers, including adult fishways, is a long-recognized problem that to date remains largely unmitigated," the study says. "Significant long-term actions to address these temperature issues are necessary for the continued survival of salmon populations, particularly sockeye." The study was completed by the FPC staff and sent with a letter October 28, 2015 by Michele DeHart, director of the FPC, to Charles Morrill, Washington Department of Fish and Wildlife, Erick VanDyke, Oregon Department of Fish and Wildlife, and Steven Hawley, citizen. All had requested similar information from the FPC about why so many sockeye salmon were unable to finish their spawning migration this summer. Hawley made the request after reading a Seattle Times article about the "snow pack drought" that left fish dying in the rivers. The FPC provides technical services to the fish agencies and tribes impacted by the operation of the Federal Columbia River Power System. The 2015 migration year for sockeye salmon was especially damaging for the two fish runs that have been making a comeback in recent years. NOAA Fisheries at one point in July 2015 estimated that 80 percent to 90 percent of the summer return of sockeye into the Mid-Columbia River were lost. The run was expected to be nearly a half million fish. The return of Snake River sockeye, listed as endangered under the federal Endangered Species Act, was even more dismal. Just 101 fish returned to Idaho, but only half of those fish swam all the way to Redfish Lake on their own. The remaining fish were trapped and trucked from Lower Granite Dam in Washington or the Sawtooth Fish Hatchery on the Salmon River in Idaho. The study says that building the hydrosystem has had a significant effect on temperature in the rivers. "By slowing water flow and increasing surface area for solar radiation, dams caused increased water temperatures in the reservoirs," it says. However, that assessment is not new and FPC says that the inability to meet water quality standards for temperature was first identified in the 1995 Biological Opinion for salmon and steelhead in the Columbia/Snake River. In 2003, the Environmental Protection Agency began to develop a temperature Total Maximum Daily Load Limit for the mainstem Columbia and Snake rivers, but the melding of the TMDL process and NOAA's BiOp water quality plan resulted in the TMDL not being finished and so a maximum load allocation for temperature was never established. "Despite continued development of Water Quality Plans over the years, the BiOp process has fallen short of ever really making an impact on water temperature beyond the actions initially identified in the 1990s," the study says. "Over thirty measures were considered to address temperature, but due to identified issues were dropped from the WQP." Spring flows at Lower Granite Dam on the lower Snake River and at McNary Dam on the mainstem Columbia River were the second lowest since the 1995 BiOp. Summer flows at Lower Granite were the second lowest since 1995 and the fifth lowest at McNary, also since the BiOp. Water temperatures at all the Columbia River dams and lower Snake River dams were higher earlier in the season than at any time in the past ten years. At nearly all the dams, temperatures exceeded the 20 degree C standard (68 degrees F) 35 percent to 46 percent of the April to August passage season, except at Lower Granite Dam which has the advantage of temperature augmentation from Dworshak Reservoir. Over the previous ten years, the 20 degree C temperature was exceeded 20 percent to 30 percent of the passage season. Exceeding the temperature standard in the Snake and Columbia rivers generally occurs in July and August, but in 2015 it began in late June, the report added. Drum gate maintenance at Grand Coulee Dam exacerbated the low flow conditions beginning in the spring. To complete the maintenance, which was required this year, the Bureau of Reclamation (the dam's operator) had to lower the level of Lake Roosevelt below its April 10 BiOp level and, in effect, use water earlier that could have been used to augment flows later. The flow situation in the Columbia River "was somewhat alleviated by the Columbia River Treaty provision of the proportional draft of reservoirs under low flow conditions, providing approximately 5 million acre feet of water from Canadian Reservoirs in 2015," the report says. The higher temperatures had a drastic effect on migrating adult sockeye. According to FPC's report, higher water temperature cause migration delays and reduced survival, and that these impacts can occur at temperatures even lower than 20 degrees C.
It's not just peak temperatures that impact sockeye, the report says. It is also likely the cumulative measure of thermal exposure and that might be a more appropriate way to measure high temperature impacts on their migration and survival. In addition, the adult passage ladders past dams "often exhibit temperature gradients because the water sources differ throughout the ladder." Temperature gradients greater than 1 degree C can significantly delay migration to spawning grounds, increase total thermal exposure, deplete the fishes' energy resources and decrease migration success, according to the report. While there has been some hope of cooling fishways at lower Little Goose and Lower Granite dams by using auxiliary pumps to put cooler water into them, the report says that likely would not have helped in 2015 since most of the adult migrants already had died farther downstream. These conditions profoundly impacted sockeye passage, travel time and survival. 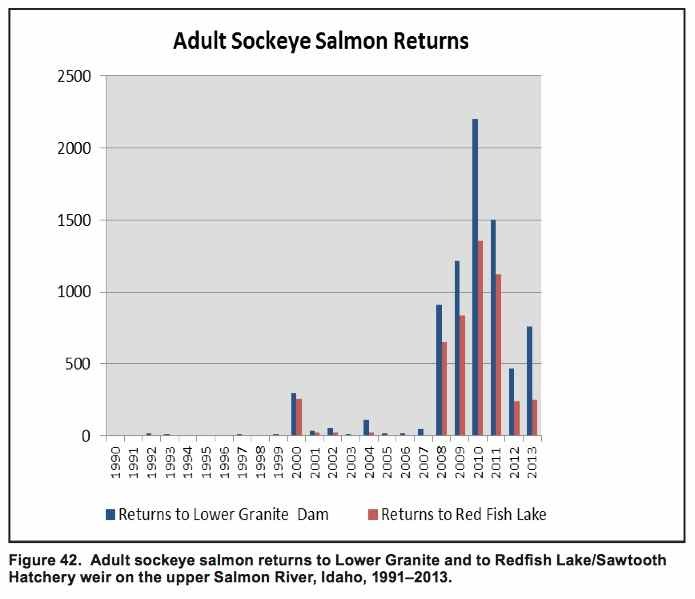 The 2009 to 2014 migration years saw survival of adult sockeye from Bonneville Dam to Lower Granite Dam of 44 percent to 77 percent. In 2015, survival was just 4 percent, the report says. Snake River sockeye that had been transported as juveniles had even lower survival rates and they had a higher fallback rate at Bonneville than in-river fish. Survival of upper Columbia River sockeye in 2015, Bonneville to Rock Island Dam, was 46 percent, the lowest among the years 2009 to 2015. Migration times in 2015 increased over the past six years as river temperatures rose, the report says.